Lighter evenings, (slightly) warmer days, and emerging snowdrop flowers can only one mean one thing. Spring, and the Blue Belt Discovery Expeditions, are getting closer. The Discovery Expeditions will travel deep into the South Atlantic Ocean to study the waters around three remote UK Overseas Territories - South Georgia and the South Sandwich Islands, Tristan da Cunha and St Helena. Here, researchers will use a wealth of equipment from deep water camera systems to microplastics nets to better understand these biodiverse environments. The expeditions will take place between February and April on the RRS Discovery as part of the Blue Belt Programme. The programme is delivered by Cefas and the MMO in support the UK government’s commitment to enhance marine protection of over four million square kilometres of marine environment across UK Overseas Territories. 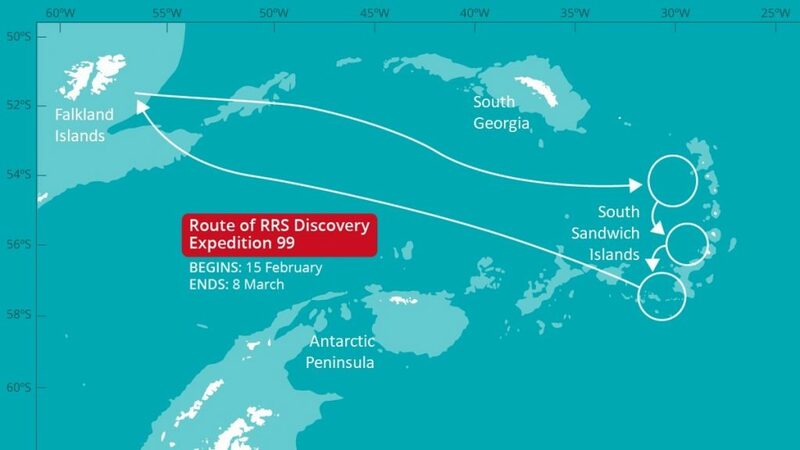 The first Blue Belt expedition, Discovery Expedition 99, will visit South Georgia and the South Sandwich Islands departing from the Falkland Islands. The remote islands are home to penguins, whales, and internationally acclaimed fisheries of toothfish, icefish and krill. Left: Testing the deep-water camera system off Cumberland Bay, South Georgia during the last marine survey aboard the MV Pharos SG in April 2018. Right: images of sea lilies and two different types of starfish taken around 260 m depth. 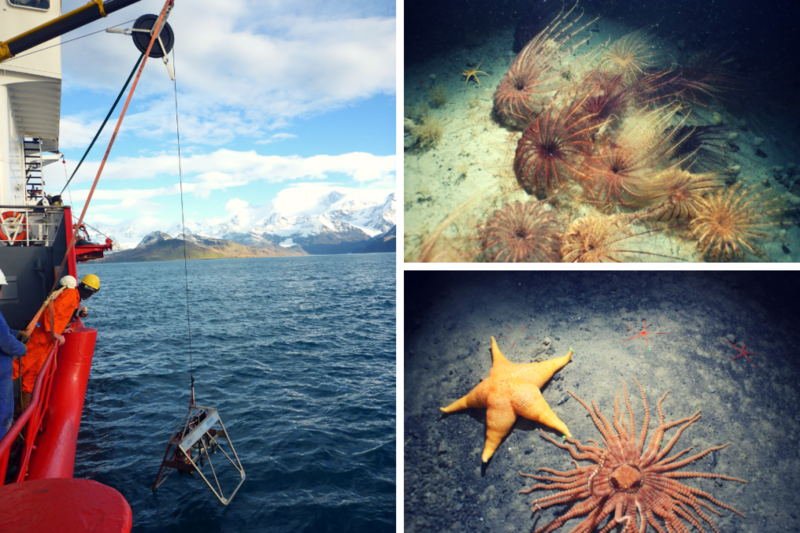 Discovery Expedition 99 will investigate the biodiversity of the continental shelf around the South Sandwich Islands. The expedition builds on findings from the last marine survey which took place over 18 days aboard the MV Pharos SG in April 2018. The team will use deep sea cameras and ocean floor sampling equipment to help assess the state of the sea floor environment and investigate the potential impact of the licensed longline fishery on the biodiversity. Marine observations will also take place during the expedition to study the populations of seabirds and marine mammals in the area. The route extends from the northern relatively warmer water islands to the southern islands situated in colder Antarctic waters. 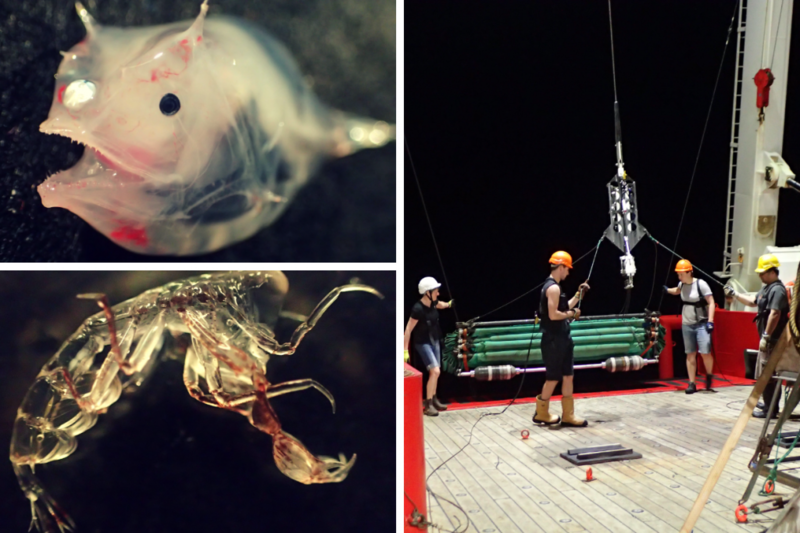 The team are particularly interested in how the species composition changes with depth within each temperature regime. Just a few days after the expedition from the sub-Antarctic returns the second Blue Belt expedition, Discovery Expedition 100, will begin. The expedition, which is a collaboration between the Blue Belt Programme and the British Antarctic Survey, seeks to study the waters surrounding the isolated volcanic islands of Tristan da Cunha and St Helena in the South Atlantic Ocean. The Discovery Expedition 100 follows on from a previous expedition to the area aboard the RRS James Clarke Ross last year. Around 11,000 specimens were donated to the Natural History Museum from the last Blue Belt marine survey. 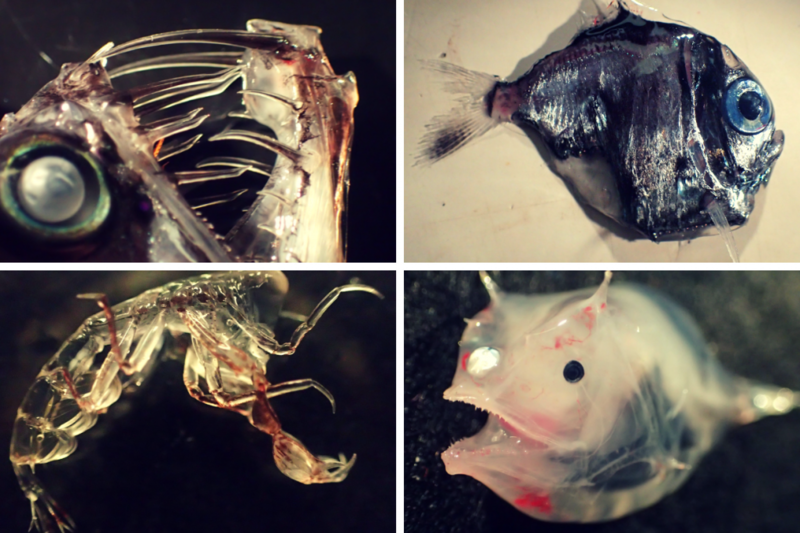 Left: some of the unusual animals caught in mid-water trawls around St Helena. Right: Hauling in the nets during the last Blue Belt marine expedition in 2018. The upcoming voyage will focus on understanding the biodiversity and habitats associated with the seamounts in Tristan da Cunha, about which very little information is known. The RRS Discovery will then travel to St Helena for the second leg of the expedition. Here, research will concentrate upon the ecosystems that live in the water column, to improve our understanding of the food webs that underpin tuna fisheries around the area.The crew will also be joined by St Helena resident, Jamie Ellick, who won a competition to join the expedition. Jamie is a keen diver who works for the St Helena National Trust marine team. He hopes the Discovery Expedition 100 will improve his knowledge of the ocean around St Helena and expose him to new areas of ocean research. He is keen to share his experience with the local community and he hopes he will inspire the next generation to take greater care of the ocean. The Discovery Expeditions will visit South Georgia and the South Sandwich Islands, Tristan da Cunha and St Helena between February and April 2019. For more information on the survey contact the Blue Belt team and follow Cefas on Twitter for the latest updates. You can find more about the work of the programme on the Blue Belt Programme webpage or you can sign up to receive the quarterly Blue Belt newsletter.